Summary: We examined the cerebellar metabolism of a 61-year-old man with a small infarct in the left middle cerebellar peduncle and an intact cerebellum. 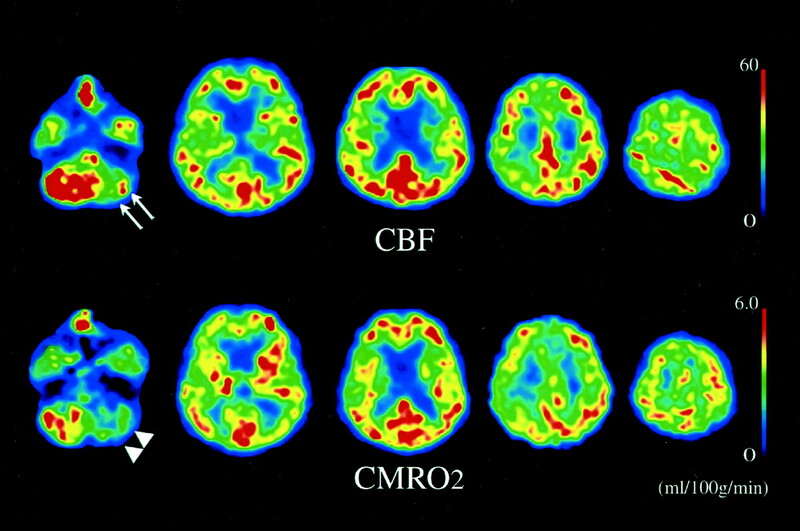 Positron emission tomographic images obtained 28 days after onset showed prominent hypoperfusion and hypometabolism (almost 50% below the normal level) in the left cerebellar hemisphere. This case report shows that neural deafferentation may cause prominent hypometabolism without morphologic changes in the cerebellum. An arrest in synaptic activity may be the most important factor for the adaptive decrease in oxygen metabolism seen in ischemic brain. Cerebral blood flow and oxygen metabolism can be measured by using positron emission tomography (PET), thanks to the high spatial resolution and accurate quantitation characteristics of this technique. Intensive examination of patients with acute stroke has shown that the threshold of oxygen metabolism required for tissue survival in an ischemic condition is approximately 50% of the normal level (1–4). In other words, the brain has an intrinsic adaptive mechanism against ischemic insults that involves a reduction in oxygen metabolism. Cerebral vasodilatation and an increased uptake of oxygen are well known to be adaptive responses of the brain to a reduction in perfusion pressure (5, 6). However, the mechanism for the adaptive decrease in oxygen metabolism has not been previously discussed. Because a 50% reduction in oxygen metabolism in the surviving tissue is unexpectedly high and almost identical to the effect of hypothermia at 32°C (7), the elucidation of this adaptive response is important for improving our understanding of the pathophysiology of acute stroke and the development of novel therapeutic strategies. The disconnection of synaptic circuits may be an important component of this mechanism, because electrical activity is arrested, but energy metabolism is preserved in the penumbra tissue (4, 8). In humans, a reduction in oxygen metabolism without any morphologic change occurring after supratentorial infarction is known as crossed cerebellar diaschisis (9). This form of hypometabolism is presumably caused by an interruption in the cerebropontocerebellar pathway. Because the degree of oxygen metabolism reduction varies between 0 and 37% according to the size and location of the supratentorial infarction (10, 11), it remains uncertain to what degree the disconnection of synaptic circuits reduces oxygen metabolism in the intact brain. We had the opportunity to examine cerebellar circulation and metabolism in a case with a solitary middle cerebellar peduncle infarct, in which most afferent and efferent fibers to the cerebellum were disconnected. A 61-year-old, right-handed man suddenly presented with severe gait unsteadiness and vomiting. Hypertension and impaired glucose tolerance had been diagnosed when the patient was 50 years old, but the patient did not undergo treatment. The diagnosis of cerebellar infarction was made on the basis of neurologic findings at another hospital. He was transferred to our hospital 3 weeks after onset. A neurologic examination performed at admission showed left-sided ataxia and ataxic speech. Both the nose-finger-nose test and the pronation-supination test performances were clumsy on the left side. No signs of ipsilateral facial palsy, hearing loss, trigeminal sensory loss, or Horner syndrome were observed. After admission, the neurologic findings did not deteriorate, and the patient showed gradual improvement. Informed consent to participate in this study was obtained from the patient and his family. An MR imaging examination was performed on the 24th day after onset and revealed an infarct in the left middle cerebellar peduncle (Fig 1, arrow), located within the territory of the anterior inferior cerebellar artery. MR diffusion- and perfusion-weighted images were not obtained. No definite infarcts were found in the cerebral hemisphere or the left cerebellar hemisphere on T1- or T2-weighted images. Cerebral angiography was not performed. MR angiography showed no definite stenosis and only slight atherosclerotic changes in the bilateral vertebral arteries and the basilar artery. MR images obtained 24 days after symptom onset show an infarct strictly confined to the left middle cerebellar peduncle (arrow). No definite infarctions are visible in the cerebral hemisphere or the left cerebellar hemisphere on T2-weighted images. Rt., right; Lt., left. PET was performed by using a Headtome V scanner (Shimadzu Corp., Kyoto, Japan) on the 28th day after symptom onset. The PET examination was performed according to steady-state methods by using 15O-labeled gases. Regional cerebral blood flow, cerebral metabolic oxygen rate, cerebral blood volume, and oxygen extraction fraction were measured. Circular regions of interest, 20 mm in diameter, were placed on the cerebellar hemispheres in the PET images. The PET images showed severe hypoperfusion (right, 68.9 mL/100 mg/min; left, 35.7 mL/100 mg/min) (Fig 2, arrows) and hypometabolism (right, 4.45 mL/100 mg/min; left, 2.75 mL/100 mg/min) (Fig 2, arrowheads) in the left cerebellar hemisphere. Elevated oxygen extraction fraction values, which have been shown in cases of misery perfusion (5), were not observed in bilateral cerebellar hemispheres (right, 38.6%; left, 40.5%). The standard PET parameters in the cerebelli of normal controls examined at our hospital’s PET center are 63 ± 6.5 mL/100 mg/min for cerebral blood flow (mean ± SD), 4.3 ± 0.6 mL/100 mg/min for cerebral metabolic oxygen rate, and 46 ± 4.0% for oxygen extraction fraction in a cerebellar hemisphere. Positron emission tomographic images obtained 28 days after symptom onset show severe hypoperfusion (arrows) and oxygen hypometabolism (arrowheads) in the left cerebellar hemisphere. CBF, cerebral blood flow; CMRO2, cerebral metabolic oxygen rate. Quantitative cerebral blood flow mapping by using PET has revealed the remote effects of focal cerebral lesions in humans. The phenomenon of cerebellar hypoperfusion and hypometabolism occurring after supratentorial infarction, termed crossed cerebellar diaschisis, occurs via the cerebropontocerebellar pathway and was first described by Baron et al (9). The cerebellum is linked to other parts of the brain by numerous efferent and afferent fibers that are grouped together on each side of the cerebellum into three peduncles. The middle cerebellar peduncle is the largest of the three peduncles and arises from the posterolateral region of the pons; it consists of the transverse fibers of the pons, which arise from the neurons of the pontine nuclei (12). In our patient, the interception of most efferent and afferent fibers of the cerebellar hemisphere by a middle cerebellar peduncle infarct resulted in profound hypoperfusion (almost 50% lower than the nonaffected cerebellar hemisphere) and profound hypometabolism (almost 40% lower), without any signs of morphologic change. The severity of this hypoperfusion and hypometabolism was greater than that reported previously regarding human study participants and was almost the same as the ischemic reversible threshold (4, 6, 13). In cases of acute stroke, PET studies have been used to document the existence of a penumbra (4, 14) in which the electrocorticogram and evoked potentials vanish but the membrane potential and energy metabolism are maintained (4, 8). In this penumbra, ischemic tissue can survive for several hours under conditions of reduced oxygen consumption (almost 50% of normal) and recovers if adequate recirculation occurs (4). Surprisingly, the maximum level of oxygen consumption suppression in the penumbra is nearly identical to that in the cerebellum in the presence of a solitary middle cerebellar peduncle infarct. Disconnection of the efferent and afferent fibers to the cerebellum suppressed the level of oxygen metabolism by approximately 40% in the present study. These findings seem to agree with previous findings of autoradiography that entorhinotomy in experimental animals causes a 30% to 45% reduction in glucose metabolism in the hippocampus (15). Because the cerebral metabolic oxygen rate threshold for irreversible injury in the ischemic brain has been found to be approximately 40% to 50% of normal (16), the adaptive decrease in oxygen consumption in the penumbra may be ascribed to the disconnection of synaptic circuits, although other mechanisms, such as the inhibition of protein synthesis, could also preserve oxygen consumption (17). The mechanism by which EEG and electrical activity is suppressed remains uncertain, but suppression of the conduction action potential in the axons of afferent fibers under ischemic conditions (18) may be important for functional depression. The present study suggests that disconnection of the synaptic circuit into the ischemic brain may further reduce the cerebral metabolic oxygen rate threshold for irreversible injury. The authors thank the staff of the Department of Nuclear Medicine and the Cyclotron staff of Osaka University Medical School Hospital for technical support in performing the studies and R. Morimoto and S. Imoto for administrative assistance. Accepted after revision March 18, 2002.